Good morning, sweet friends! I don’t know about you, but I could use some sunshine. With Winter’s darkness and the desire for Spring, I decided that pretty flowers and happy color would be my inspiration for today’s tablescape. These pretty flowers have some of my favorite colors, and add a wonderful accent to the table. For the centerpiece, the floral arrangement was placed on a tole tray with a pretty floral sugar bowl and creamer. Gold lace placemats were used along with a beaded gold organza runner placed at an angle. The plates were purchased at Homegoods a couple of years ago. They are by Sadek and are a reproduction of the Chinese export porcelain collected by Harold S. Vanderbilt. I am so happy that you joined me today as I dream of Spring. It will be here before we know it. I hope that you enjoy your day, and that you have a wonderful weekend. You now have me dreaming of Spring, Shannon. Your table looks beautiful! I love the blue and white and the flowers are perfect! Happy Thursday! Thank you, Kristy, and Happy Thursday to you too! I hope that you enjoy your day!!! Beautiful table Shannon…LOVE those plates…such a great find at HomeGoods…I have never seen these at mine…the table certainly says that Spring is in the air in your home!…How it so brightens up the room! … BTW, always meant to tell that that I love your sheath back chairs! Thank you, Shirley! The chairs belonged to my in-laws. My mother-in-law decided to go with a more modern look so I lucked out and got these beautiful chairs. I always admired them. I hope that you enjoy your day and that you have a wonderful weekend!!! Oops!…typo …. “sheaf back chairs” !!! Gorgeous table! I love those dishes. They’re elegant, yet comfortable. I’m looking forward to Spring, too. Thank you, Zenda, for the sweet comment. I hope that you have a beautiful day and a wonderful weekend!!! Shannon, your tablescape is definitely a nod to spring…those plates are so pretty. I would love to be a guest sitting at your lovely table! Happy Thursday! Thank you, Pam and Happy Thursday to you too! Enjoy your day!!! This is my first comment on your blog, even though I have been following you for quite some time. 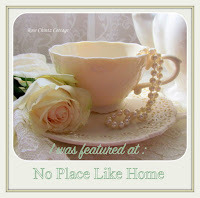 I must say that I just love your decorating style, and that I find inspiration in each and every post. Thank you, Shannon! Hi Debra! I am so happy that you left me such a sweet and kind comment this morning. Thank you so much! You made my day! A comment like yours makes doing this blog worthwhile. I hope that you enjoy your day, and that you have a wonderful weekend!!! Your blog is beautiful! Visiting via Imparting Grace! Thank you, Lil! I am so happy that you stopped by for a visit! I hope that you are having a wonderful weekend!!! I am also dreaming of spring, even as the snow comes down today! Pretty table! Thank you, Patti! I hope that you enjoy your day!!! Shannon, your spring time table brightens my day. The pretty plates remind me of a springtime garden. Hope you have a great day! Thank you, Sarah, for the sweet comment! I hope that you are enjoying your weekend!!! What a LOVELY table! Those flowers are absolutely gorgeous, and that pitcher is the perfect choice for them. Everything looks so fresh and beautiful here that I wish I could join you. Visiting from Grace at Home. Thank you, Pattie, for the the very sweet and kind comment! You are welcome at my table anytime! I am so happy that you stopped by for a visit. I hope that you have a beautiful day!!! Your dining area looks so cozy and inviting and the spring touches on your table are so uplifting on this dreary winter’s day. Love the paint colour on your walls! Thank you, Lori! I hope that you are enjoying your weekend!!! Thank you, Rebeca! I hope that you are enjoying your weekend! Thank you, Veronica! I hope that you have a beautiful day!!! What a beautiful dream of spring you’ve put together! The flowers are beautiful and definitely brighten things up! Those are pretty dishes- love their colors! I’m dreaming of spring but it won’t truly be here until April! Thank you, Liz! I am so dreaming of Spring too. Our weather here in Oklahoma has been really crazy this year. We have had some 70 and 80 degree days. It makes you wish for Spring. I hope that you enjoy your day!!! Beautiful colors in your flowers and plates. Your plates are striking and the napkins look great with them. Spring is around the corner for you I know. It has sprung here weirdly. It got down to 34 last night and a high of 70 is predicted for today. I’m in south Alabama and I need to look up where you are. Thank you, Bonnie, for the sweet and kind words. Our weather in Oklahoma has been like yours. It is in the 30s in the morning with highs in the 70s in the afternoon. It has been a crazy Winter! I think that is what has me dreaming of Spring. I am ready for green grass, trees, and pretty flowers. We are visiting your pretty state in May for our family vacation. It is one of favorite places to visit. We are staying in Point Clear and using it a spring board to visit other areas. My kid’s love Orange Beach! I hope that you enjoy your day!!! I love your dining room and table setting. Everything looks so elegant, but homey and comfortable at the same time . . . like you’d just like to walk into that room and sit down. Thanks for the nod to spring! Carol, thank you for such a sweet and kind comment. I am so happy that you stopped by for a visit! I hope that you have a beautiful day!!! Thank you, Carol, for your sweet comment! I hope that you enjoy your day, and that you have a wonderful weekend!!! Thank you, Sherry! I hope that you enjoy your day!!! So fresh and pretty Shannon! My husband brought me yellow roses yesterday, I need to set a table! The plates are beautiful but my eyes went straight to that pitcher, it’s beautiful! Thank you, Jenna. I saw your beautiful yellow roses this morning on your pretty tablescape. You did a wonderful job! I hope that you enjoy your day!!! Fresh flowers go such a long way to bring up our mood and brighten our homes and our lives, don’e they? Thanks for sharing at Celebrate Your Story! Thank you, Chloe! I hope that you enjoy your day!!! Your table is beautiful! The dishes, the flowers, and all the little details make it bright and welcoming. I always love your decor. Stacey, you are so kind! Thank you for the sweet comment! I hope that you have a beautiful day!!! Beautiful table, Shannon. Love your colors. Have a great weekend. Thank you, Katie, for the sweet comment! I hope that you enjoy your day, and that you have a wonderful weekend!!! I am straining at the bit to break out my spring decor. Thanks for the inspiration!